Lenox Laser is the leader in small hole technology. We can drill microholes in most materials. Our team of experts have compiled a list of useful and common materials for your reference. If you wish to contact a professional about a specific material please feel free to use our Quotation Tool to explain your needs. 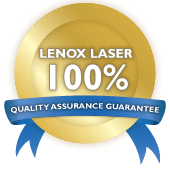 This list is not fully comprehensive and we here at Lenox Laser are always looking to innovate new solutions. We are the pioneers of laser drilling and we keep at the front of many industries including pharmaceutical, semiconductor, aerospace, photography, and astronomy. 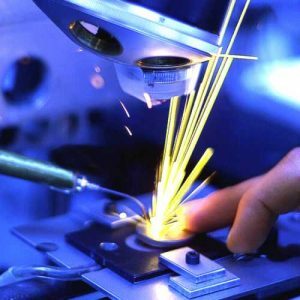 Lenox Laser works with many different material suppliers to always have top end inventory available. A few high quality suppliers are listed below. Aluminum is a very useful lightweight metal and has become the second most used metal in the world behind only Iron. It is easily machined and highly malleable. Aluminum has great corrosion resistance due to a layer of aluminum oxide that forms on the surface when exposed to oxygen. The corrosion resistance can be improved further using galvanic reactions with alloyed Copper. Antimony is generally applied as an alloying material. In it’s pure form it a silvery gray soft metal. It is stable at room temperature, but will begin to react with oxygen when heated. It is resistant to acid and is used some batteries. Antimony is a poor conductor of heat and electricity. Brass is an alloy made of copper and zinc. The composition of the alloy can vary to achieve different properties. It has a higher malleability than bronze or zinc and a relatively low melting point. Brass alloys are frequently and easily recycled. Aluminium can be added to brass to make it stronger and more corrosion resistant. To improve resistance to wear and tear, iron, aluminium, silicon, and manganese can be added to the alloy. Copper is a chemical element that is known for having very high thermal and electrical conductivity only second to silver. It is used in many different alloys and building materials. Although silver has more conductivity, copper is used more frequently due to its lower price. The metal in its pure form also is very ductile with low hardness. Copper will form a layer of brown-black copper oxide when exposed to oxygen and a greenish layer when exposed to sulfides over time. Gold is a softer metal with a characteristic yellow color and is one of the least reactive elements. Being the most malleable of all metals, gold can be beaten into transparent sheets of gold leaf. These sheets heavily reflect yellow and red light. This makes gold great at reflecting infrared light. Here at Lenox Laser gold is only used in a few standard products listed below. In these cases the gold is used as plating one side with a copper base. Germanium is a whitish-grey solid metalloid. It is primarily used as a semiconductor metal for fibre-optics, infared applications and solar cells. The conductive properties largely depend on the purity of the material. It doesn’t hold up well in nitric acid and aqua regia, but it is largely stable in most acidic and alkaline environments, and it has low toxicity. Molybdenum has an extremely high melting point and is used in many different alloys. Only five naturally occurring elements have a higher melting point. It is produced as a grey powder and can be toxic in this form. Molybdenum is generally used around the world in high temperature and high pressure situations. Nickels has great resistance to corrosion and is frequently used as plating for this reason. Frequently it is used to plate brass and iron. It even retains much of its corrosion resistance when red hot. One of its main uses is in alloys to make materials such as stainless steel. Many of our gaskets are made using Nickel and are linked below. Silicon is a metalloid with a solid bluish-grey appearance. It is used most often in its pure form in the computer and microelectronics industry in solid-state devices. An unusual characteristic is that it has a greater density when it is in liquid form, and it expands when it freezes. Silicon is more reactive than Germanium, a close relative in the periodic table. Silver is used in mirrors for its high reflectivity and it is also extremely malleable. It also has the highest electrical conductivity and thermal conductivity of all metals. Silver plating will be used sometimes to improve conductivity. It can also be a useful catalyst in chemical reactions. Silver will tarnish slowly in open air due to sulfur compounds. Lenox Laser has many silver plated gaskets. Lenox Laser products use many different types of stainless steel in our standard products. Always be sure to check the material listed on the product page on standard products before purchase and be sure the material listed is up to the required standards. If a different material is needed please contact us and we will be happy to help you.Frequently used alloys by Lenox Laser are SS-303, SS-304, and SS-316. This will always be listed under the materials section. Stainless Steel is an alloy designed to resist corrosion and rust. It is used when a corrosion resistant steel is needed. It differs from carbon steels by the amount of chromium used. The chromium only protects the steel in environments with oxygen due to the layer of chromium oxide that builds up on the surface. Stainless Steel is one of Lenox Laser’s most used materials, and due to the numerous products it is made with, none will be listed here. Steel is an alloy of iron and primarily carbon. The carbon hardens the iron lessening it ductility and strengthening it overall. It has high tensile strength at a relatively low cost. Steel is one of the most common materials used throughout construction and has many other applications due to its useful properties. Standard Lenox Laser products only use stainless steel, but custom work can always be done if needed. 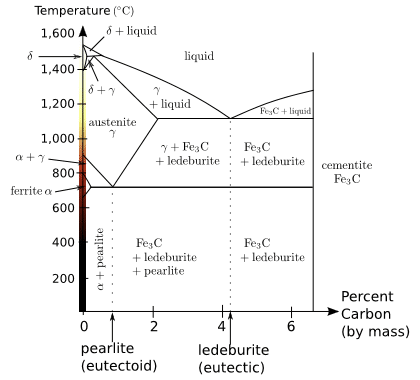 The chart on the right shows the states of steel under different temperatures based upon the percent carbon. Titanium has an extremely high strength to density ratio and very good corrosion resistance. It is very useful in aerospace alloys due to it light weight and strength. It is frequently alloyed with aluminum for this reason. It is highly ductile especially in an oxygen-free environment and has a fairly high melting point. Titanium binds well with bone so it is used frequently in surgical applications. Tungsten bears the highest tensile strength and melting point of all metals in pure form and is generally alloyed with other metals to strengthen them. Alloying a small amount of Tungsten with steel can greatly increase its toughness. When made pure it retains a hardness that exceeds that of many steels and can easily worked. Zinc is frequently used to galvanize other metals like iron or steel. Galvanized steel is used in car bodies and bridges. It is also used in brass alloys. It has fairly a fairly low melting point and boiling point for a metal. Lenox Laser does not sell any standard products made of pure zinc although it is used in some products as part of the alloy. Kovar is a trademark of CRS Holdings inc. Delaware. It is a nickel-cobalt ferrous alloy designed to be compatible with the thermal expansion attributes of borosilicate glass. The alloy is comprised of mostly iron, copper, and nickel with sometimes small amounts of carbon, silicon, and manganese. It can be used for hermetic seals in harder Pyrex glass and ceramic materials. Tantalum today is used in capacitors in electronic equipment like mobile phones and computers. Along with electronics, tantalum is also used in alloys to create tools for metalworking and high powered parts. It is highly conductive to heat or electricity. The metal is known for its great resistance to corrosion from acids. It also has a relatively high melting and boiling point. Havar® is a heat treatable, cobalt base alloy that boasts a very high tensile strength. The alloy has excellent corrosion resistance and has the advantage of being non-magnetic. Applications have included gap spacers in magnetic heads, pressure diaphragms, power springs, and target foils in nuclear physics. Monel is another nickel alloy made of mostly nickel and copper with small amounts of iron, manganese, silicon, and carbon. The alloy is stronger than steel and malleable. It is relatively inexpensive and resistant to corrosion. Similar to some of the other alloys listed here it has a low coefficient of thermal expansion. Pitting can occur when exposed to stagnant saltwater and the surface will sometimes discolor when exposed to atmospheric conditions. Invar is a nickel/iron alloy invented by Swiss physicist Charles Édouard Guillaume. He received a Nobel Prize in 1920 for his discovery. Invar is know for its very low coefficient of thermal expansion. This means that it does not contract very much with large temperature changes. The alloy is used when high dimensional stability. Soda-lime glass accounts for about 90% of all manufactured glass. It is used in windowpanes, bottles, and jars particularly for food storage. Glass bakeware is frequently made of a tempered soda-lime glass. It is technically divided into flat glass (for windows) and container glass (for shaped containers). Borosilicate glasses are known for having exceptionally low coefficients of thermal expansion. This makes them much more resistant to thermal shock than common glass. It is sold under many trade names like Pyrex, Borosil, Simax, and many more. It is used along with many nickel/iron alloys due to their ability to resist expanding or contracting in temperature changes. Fused silica or fused quartz is glass containing silica in its non-crystalline form. It has extremely high melting and working temperatures for glass because it has no additives to lower them. It has better optical and thermal properties than other glass due to this purity. Fused silica is used in semiconductor fabrication and laboratory equipment. It is used for lenses for the ultraviolet spectrum because it has better ultraviolet transmission than most glasses. It also has a low coefficient of thermal expansion. Indium Phosphide is a semiconductor and a crystalline structure. It is brittle, but is very effective for high frequency and high power electronics due to its electron velocity. It’s structure is very similar to GaAs, another semiconductor material. Lithium Fluoride is an inorganic crystalline structure. It is used mostly as a component to increase the efficiency of molten salt production, but it does have other uses. It has a large band gap, which enables it to be transparent to short wavelength ultraviolet radiation. Therefore it is used widely in radiation detecting and optics. Macor is a glass-ceramic that has good thermal insulating properties and has very little thermal expansion. This material is easily machinable, and there are no known toxic properties. It can withstand high temps (1000 ° C), and can be joined or sealed to itself or other materials in a number of ways. Polarcor is a polarizing glass that is extremely resistant to thermal, chemical and physical damage. It retains excellent optical properties when exposed to harsh environments. It retains properties at very thin thicknesses (.2 mm). Polarcor exibits high extinction and low insertion loss between 600nm and 2300 nm wavelengths. Sapphire is a typically blue gemstone, most commonly used for jewelry. However, due to it’s remarkable hardness properties, and it’s resistance to radiation, it is also used in scientific instruments, small ball bearings, and thin wafers used as insulating substrates for solid-state electronics. A traditional method of integrated circuit manufacturing is coined “Silicon on Sapphire”, or SOS. A very thin layer of Silicon is grown on a Sapphire wafer, providing the radiation insulation. Steatite, also known as Soapstone is a naturally ocurring metamorphic rock in nature, composed primarily with the mineral, talc, along with varying amounts of chlorite, micas, amphiboles, carbonates and other minerals. It is very heat resistant, has a high specific heat capacity, but it is also very soft and scratches easily. It has been used as a material to make statues, cookware, and ornaments for thousands of years. Zinc Sulfide is a crystal ocurring in nature. When it is pure, it’s color is white and transparent. It is also a semiconductor, but it is more widely used as a white pigment for dyes. It is also used in infared optics when transparent, and a detector of alpha rays because it is luminescent in the presence of them. Zinc Selenide is a light yellow crystalline structure. It is known for it’s low refractive index for most wavelenghths, which makes it work well for certains parts of infared optics. It is made into windows and lenses among other components. It is also a semiconductor, but rarely used for electrical applications. It emits blue light when in LEDs. Polycarbonates refer to a group of thermoplastic polymers that contain carbonate groups in their chemical structure. They can be strong and tough materials with some grades being optically transparent. The polymers are known for being easily worked, molder, and thermoformed. Polycarbonates get their name from the carbonate groups it contains. These groups help improve temperature resistance, impact resistance, and optical properties. It is known by a few trademarked names such as Lexan, Makrolon, and a few others. Polyimide or PEEK plastic is a thermoplastic, which means it can withstand a high amount of heat (343 °C / 649.4 °F melting temp). It has very high resistance to chemical and biological degredation. It is used primarily for ball bearings, simple auto parts, plumbing parts, and in some cases medical implant structural material. PEEK is easily machinable, and is considered a high end engineering plastic. Nylon is a generic term for a family of synthetic polymers called aliphatic or semi-aromatic polyamides. They are frequently made into shapes, films, and fibers. Nylon is a thermoplastic. It was introduced as a synthetic replacement for silk and has been used in parachutes and flak vests by the military. LDPE stands for low-density polethylene. it is a thermoplastic made from the monomer ethylene. LDPE is defined by a density range of 0.910–0.940 g/cm3. At room temperature, only strong oxidizing agents and some solvents (which can cause swelling) will cause a reaction. It has a fairly low melting point and is not a particularly strong plastic. Teflon, the brand name of Polytetrafluoroethylene (PTFE), is a synthetic fluoropolymer of tetrafluoroethylene. PTFE is a fluorocarbon solid. Fluorocarbon solids are recognized for having a high-molecular-weight compound and consisting wholly of carbon and fluorine. PTFE is hydrophobic, meaning neither water nor water-containing substances wet PTFE, demonstrating mitigated London dispersion forces, because of the high electronegativity of fluorine. PTFE holds one of the lowest coefficients of friction of any solid. Alumina ceramic are ceramics made with high amounts of alumina. These are ideal for environments where wear and corrosive resistance is paramount. They also have high thermal stability, which means that they are widely used in areas where resistance to high temperatures is needed. They have high melting points and high hardness, but mechanical strength is reduced at temperatures above 1000 ° C. Alumina ceramics have relatively large coefficients of thermal expansion. Aluminum Nitride is a ceramic material with excellent heat dissapating qualities. It is being used widely in high power microelectronic circuits due to it’s high thermal conductivity for an electrically insulting ceramic. It is stable at high temperatures, with a melting point of 2200 ° C. In highly acidic environments, the acids tend to dissolve the secondary phases in the grain boundries, whereas in highly alkaline environments, the base material is dissolved. Silicon Carbide is a ceramic with excellent thermal and hardness qualities. It is used in a wide variety of applications including automobile parts, bulletproof vests, and cutting tools. It is also a semiconductor with high voltage and heat resistance. It is very resistant to high acidic and alkaline environments.